The one storey quality old-style guest house opened its doors to guests in 2002. It''s timber framework, wooden casting and tiffany glasswork all remind us of the past. The hotel''s restaurant and grapevine covered outdoor tavern entertain guests with live gypsy music while serving them quality regional wines and traditional local dishes. The outdoor guarded parking lot is provided free of charge. An apartment with a mini-kitchen and a fireplace. All our non-smoking rooms are furnished with decorative high-quality carved oak, from the ceiling beams and wall coverings down to the wooden flooring. All the rooms are equipped with private bathrooms and adjustable climate control. Rooms can have extra beds installed or taken out by will. We have a more spacious apartment with a mini-kitchen, bathroom (with a bide and corner-tub), and a fire place available. Room prices include a buffet style breakfast. We can provide half or full board (2 or 3 meals a day) on request. Into all room can be put extra bed. All the rooms have SAT stereo TV, refrigator, air conditioner,safe included, room service can also be requested. Room prices include a buffet style breakfast. We can provide half or full board (2 or 3 meals a day) on request. 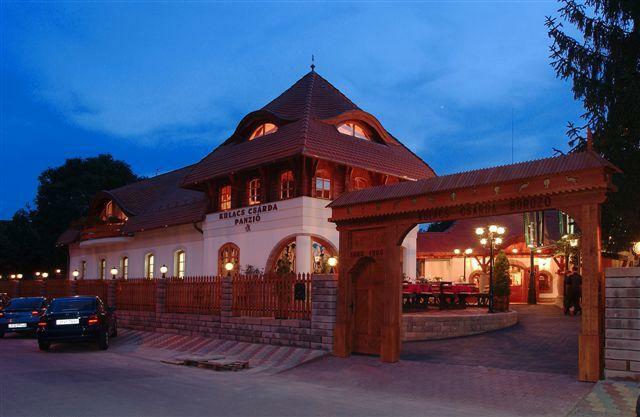 The hotel''s restaurant and grapevine covered outdoor tavern entertain guests with live gypsy music while serving them quality regional wines and traditional local dishes. The restaurat have 5 chambers, in total 350 persons. wine taster lunch you are a dinner, a goulash party, folklore program, Hungarian melody singer, country wedding, vintage entertainment, wine knight initiation. Programs, weddings, banquets, standing receiving and a conference fell we undertake transacting him. Kulacs Csárda Panzió is located in Eger, in the heart of Szépasszonyvölgy, famous for its several wine cellars carved in tufa stone. Our cellar, evoking an historical atmosphere, seats 350 people.In five arched, air-conditioned halls our guests can taste our Hungarian specialities in addition to the wide range of the products of the best wine-makers of the Eger wine region.The relaxed mood of the guests is guaranteed by the six-member gypsy band of the csarda.